A Note from Fatty: The “Meet BSNYC” winners have all been sent email, and all the people who won a t-shirt have responded. The person who won the grand prize, however, has not. So. If you donated some money for this contest and haven’t checked your email in a while, well, maybe you should. 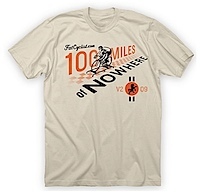 Another Note from Fatty: The response for the 100 Miles of Nowhere has been huge. I am getting really excited for this strange event. And you still have time to register. Go to yesterday’s post for details. 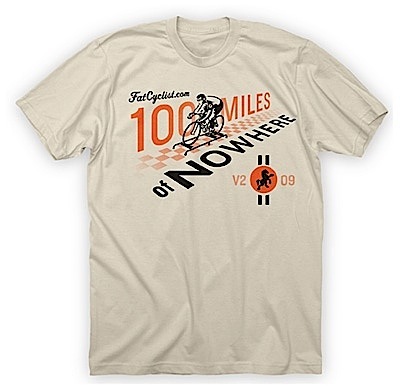 Also, I have added a section at the Fat Cyclist Forum for discussion about the 100 Miles of Nowhere. If you are looking for someone in your area to do the race with, post a message there. I have been coping with a cold for about a week, now. I’ve been through the sore throat stage, the watery eye stage, and the stuffy nose stage. Through it all, I have been taking daily advantage of one of cycling’s great little secrets: when you’re on the bike, you feel fine. Your head clears up. You can breathe. Your throat stops hurting, and your body stops aching. Well, maybe your body continues to ache, but it’s a different kind of ache. A couple days ago, for example, even though I had been feeling miserable the whole day, Brad and I went riding on Corner Canyon, to see if the warm weather we’ve had for the past few days has opened up Jacob’s Ladder: the highest trail in Corner Canyon, and a crazy, rocky, rollercoaster of a descent with sharp embedded rock everywhere and exposure on both sides. The whole time I was riding, I felt great. In fact, I felt like I was descending better than I ever have in my life. Even Brad noted in his blog that I had a banner day, descent-wise. Obviously, I’m still learning to use this camera. Lessons learned from this ride include that I need to adjust the mount on the helmet so it doesn’t point down so far, and to try to tilt the mount up for rear-facing mounts, so I get more of the rider instead of just the trail. Still, you wouldn’t have thought, looking at this video, that I had been feeling sick as a dog the whole day. The thing is, I’m about to rely verrrry heavily on the “I feel fine when I’m on the bike” effect. Because today I head out for the Ride Around White Rim in One Day (RAWROD) 2009. Even though I have a near-constant hacking cough that is sometimes so fierce it doubles me over, I am not missing this. After all, I’m sure that the “I feel fine when riding” effect will hold over the course of a 100 miles of mountain biking. Watching the other rider is cool, but I most like the forward-looking shots–they really give a feel for the trail and the movement. Fun to enjoy vicariously since I can’t ride right now. I don’t know if the “I feel fine” mantra would carry me through a 100 miles of mountain biking but I think you can safely assume you will be the snot-rocket champ of the day. Another great video, the learning curve is pretty steep but you’re already producing some really good stuff. That trail looks FUN! I obviously need to live in Draper. Hmmm. Time to bust out the play bike and go have some fun! Take it easy with RAWROD. The only person you’re competing with is yourself so cut yourself some slack, stay hydrated, stay fuelled and keep grinning through the coughs. Good luck, stay safe, bring back video! What goes before “I Feel fine”? White Rim looks and feels like the end of the world. I like your logic…it makes sense to me. Although, that might not be saying much. Good Luck. I’m not sure which your videos do more of: make me want to go mountain biking, or make me want to move to Utah. Either way, good job. I’m beginning to wonder if you’ve stolen my iPod. Couldn’t agree more about the curative effects of the ride. I have found riding to be a good hangover cure too… not that I ever have those. Have all the fun you can with that 100… I doubt I could do it, even if I was feeling right as rain. I’ve been checking my email all day looking for the notice that I won. Good luck at the race this weekend. what about mounting it to your front fork facing forward? Just a thought. =) Ride safe. I love the annual RAWROD write up. Good luck and, remember, no boulder chucking! Was that guy riding UP the top end of Jacob’s? That dude’s got potential for a serious collision/crash – almost caught on your camera! Nice video Fatty. I did a 110 mile slog with a persistent cough, as long as I was moving it was great, no coughing, I could even be mistaken to be in good shape if you didn’t look too closely. But, I take a second to do a gas-station rest stop (included donuts), cue uncontrollable coughing, if you didn’t know better you’d swear i was dying. Great for garnering sympathy, difficult to swallow anything without spraying whatever is in your mouth. Chilly 20 miles in today – No rain, it is actually sunny, but it froze last night, and I started my ride in 34F shade. the weatherman is sometimes a smooth criminal. Is riding the same short course with a fellow entrant cheating? And if my 1 mile loop has a beautiful view of the mountains, should i only look to the left? I’m sure your friends will enjoy sharing your cold. Perhaps it’s past the contagious stage. That would be good. Nice video, keep ‘em coming. Fatty – I’ve just come down with something. The problem is that I feel run-down. I can handle riding with all of the other stuff, but I feel run-down, and I fall asleep waaaaay tooooo easily, I just can’t motivate. Have you felt that way? Has biking helped it? Awesome blog today, we can all relate to the I feel fine mantra, however I agree with others that I feel fine may be good for a shorter ride, but not a hundred. TAke care of yourself. I remember a while back when you got the video camera but don’t remember the details- this is too cool and I want something like this. Can you share the details of your setup again? Thanks! Why does the rear wheel/tire appear to spin only occasionally in the video? I think that’s just an artifact of the video capture, the frame rate is oddly in sync with the wheel spin. Though you won’t get to meet BSNYC, you’re still a winner — especially since you’re with Team Fatty Philly! Great video! I just posted this on Brad’s blog, but i’m hoping someone can answer this since he’ll be away for awhile. I rode up Jacob’s Ladder today for the first time. I started at the sign and rode up to the next sign. I saw that a trail goes pretty steep up and one on the left seemed to go down. I walked up the steep way and it seems to level out but go on forever. I turned around and rode back down the way i came up. Did i miss out on something special? is there another trail beside the main JL switchback up and down? I rode GFalls down from the JL entrance…what a great ride! any chance you could post a pic of all of your bikes? Like one at a time, with a brief description? is your riding buddy riding a Waltworks? The fork sure looks like one of walt’s. Fatty-sounds like you’ve got the Swine Flu that is going around. I had if, took more than 3 weeks to start feeling even close to normal. No vaccine, just take care of yourself. @Philly Jen – I’m sure that I’ve passed within a mile of BSNYC when riding around in Brooklyn. That’s likely near enough for me anyhow. And yes, part of the winning team in Philly. Well grabbing the opportunity for a cheap laugh what I learned from the rear mounted angle is that both Katie and Brad were looking for opportunities to overtake. The videos are brilliant and as a non mtber I really enjoy them so much so that my wife Sal was going to phone Sue and ask if it was allright for me to come over and play. Really looking forward to video of Carrie’s ride soon. Cheers get better soon. Take it easy with the illness. Don’t want you coming down with walking (riding?) pneumonia. Hi FC. Whats the frame rate of the video capture? I notice the rear wheel oddly appears to flotate above the ground. It looks pretty masochistic, as if all you power you deliver into the pedals is just lifting up the rear wheel. Why not mount it to a friend’s bike so we can see YOU? Love the idea of pedaling for charity. You haven’t been to Mexico lately, have you??! !